James Harden is fast becoming the go-to star for millennial-savvy brands. In the run-up to Taco Bell's Super Bowl commercial, the hirsute Houston Rockets guard helped the brand build buzz by appearing in a cryptic teaser for its mystery menu item, ultimately revealed as the Quesalupa (basically, a chalupa with cheese in its shell). He also showed up in the chain's 30-second Big Game spot. 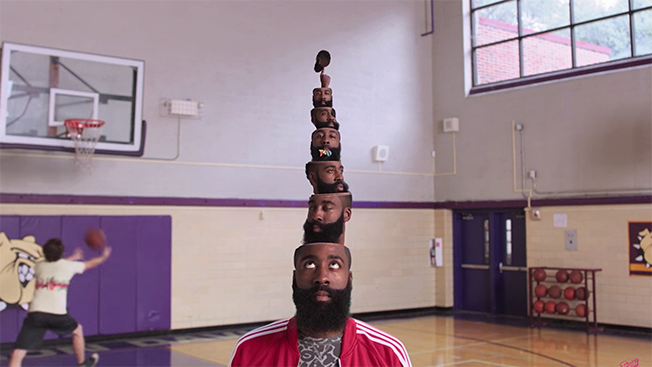 Now, Harden lets his quirky personality and famous facial hair run wild in a new campaign touting Ferrara's Trolli brand gummy candies. "The core Trolli target is millennials and Gen Z consumers," Jill Manchester, Ferrara senior vice president of marketing and brand strategy, told Adweek. "We know these consumers like to keep it real and be authentic to their true self. This same spirit is what drives Trolli and drives James." Harden's a big part of Ferrara's plan to double sales to $2 billion by 2020. Trolli contributed $167 million in revenue for 2015, up nearly 16 percent year over year, outpacing overall category growth by more than 5 percent. Given the growing renown of the superstar (he has almost 7 million followers across social media) and the NBA's popularity with young adults, Manchester believes the campaign will keep the brand's youthful audience engaged and attract new fans. During the shoot, "he was constantly making funny faces or rolling his eyes, and the entire crew would crack up," said Manchester. "We had a lot of retakes, and the audio is filled mostly with people laughing. He brought his hover board and scooted around the set." The brand tweaked its "Weirdly Awesome" tagline to "#BeardlyAwesome" on social platforms, and Harden's beard will respond to tweets that use the hashtag. Meanwhile, fans who just can't get enough might enjoy the "never-ending Harden beard" blooming in perpetuity on the brand's Instagram account. "James also has his own special ritual for eating Trolli Sour Brite Crawlers," Manchester said. "He takes a bite, one color at a time, one half at a time." Soon, the pitchman will be able to practice that technique on gummy versions of himself. A Trolli Sour Brite Weird Beards line extension—with Harden's smiling face represented in all its shaggy splendor—hits stores this spring.